Okay, so here's another way to do Mother's Day right, and the best part is how ridiculously simple it is! For all you dear readers who aren't into baking, long hours spent over a hot stove, or even if you just HAVE to throw something together quickly and still maintain rock star status in the eyes of your loved ones...this is the dessert to run with. It requires only the ability to mix cream in a bowl, melt chocolate, and assemble pretty ingredients. YOU can do this! All of you! And you can modify as needed. No trifle dish? Use a 9x13 pan. No fancy mixer? Elbow grease and a spatula work just as well! Okay, rock stars, check it out! 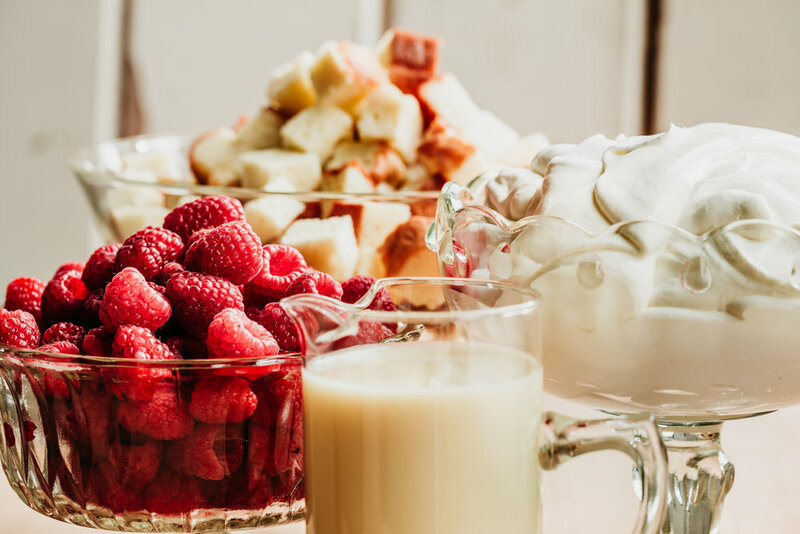 In a double boiler over medium heat, melt 2 cups whipping cream with the white chocolate chips until smooth and creamy; set aside and cool completely, about 60 minutes. In your stand mixer or with a hand mixer, whip the remaining heavy cream, vanilla, sugar and salt until soft peaks form; set aside. To assemble your trifle you will need a trifle dish. It’s a clear glass vessel on a pedestal. They can hold anywhere from 1-4 quarts of food. This trifle makes about 3-4 quarts prepared. If you don’t have a trifle dish feel free to use a 4 quart clear glass mixing bowl. You will be making 3 equal layers and ending with fresh cream, a few raspberries and swirl of white chocolate ganache. Add one third of the crumbled cake to the bottom of the dish. Put 1/3 or the berries over the cake, drizzle 1/3 of the white chocolate ganache over top of the berries and top with the whipped cream. Repeat this process 2 more times and decorate the final cake with a few berries and drizzle of white chocolate. Refrigerate this cake for at least 1 hour or up to over night before serving.